I just finished up this crocheted baby pinafore and booties for a shower gift. I used a H (5 mm) crochet hook and Lt Country Peach Caron yarn to crochet both projects. 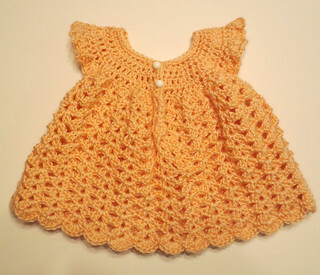 Here is the link to the baby pinafore pattern which is called Angel Wings. I found the pinafore takes about 4+ ounces of yarn to complete. 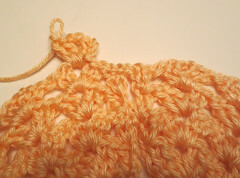 I made a few changes to the pattern and worked it in the round after row 8. At the end of row 8, I joined with a slip stitch into the Ch 3 and work in the round from that point on. I slip stitched over to the first shell as shown in the photo below. Ch 3, DC, Ch 2, 2 DC all in the first shell space and then just worked shells around. I joined to the Ch 3 of the first shell then and just repeated at this point. I have seen this pattern with the opening in the front and the back. I chose to have the opening in the front and added two round white buttons near the top of the pinafore opening. Final measurements for my pinafore are 12 inches long from top shoulder to hem. 9 inches wide across front from armhole to armhole edge. Click on any photos to supersize them if needed. 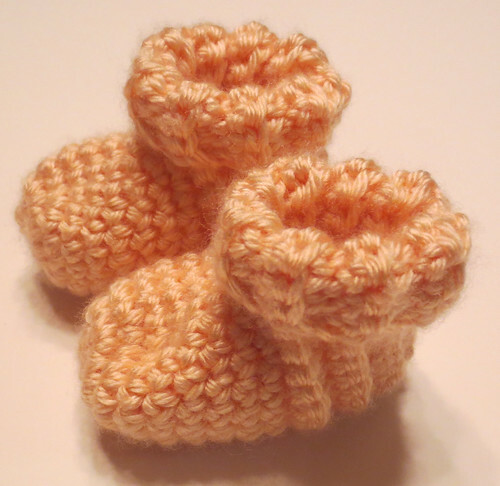 I added a pair of my crocheted cuffed baby booties to complete the gift set. Here is the free pattern for the crocheted baby booties. I believe the pinafore and booties will fit a baby from 3-5 months. I really enjoyed crocheting the pinafore pattern and think it will look so cute over a onesie t-shirt.